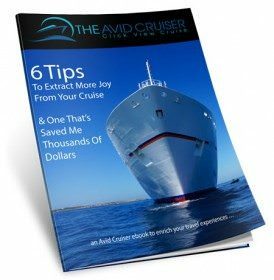 It’s not often that you visit destinations where the locals and tourist authorities advise you to “get out of town.” But in Rostock, Germany, and the nearby seaside resort, Warnemunde, that’s exactly what many cruise passengers are hearing. It’s not that they, or any tourists, are unwelcome in Rostock and Warnemunde. The Baltic ports see more than 150,000 cruise passengers annually, according to Cruise Europe statistics. So why encourage them to leave? Cruise tourism authorities in both destinations are aware of the appeal of Berlin as well as the fact that theirs are the closest Baltic ports to the German capital, only three hours away by train. 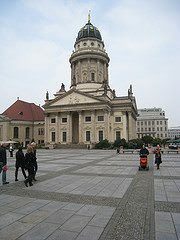 Berlin, however, requires a full day on excursions offered by many of the cruise lines. Should you visit Berlin and skip Rostock and Warnemunde? Not so fast. By give short shrift to Rostock and Warnemunde, you’ll miss two worthwhile destinations. My advice: See Rostock and Warnemunde and save Berlin for another visit. Berlin deserves more than a one-day visit. To help you decide, following is a tale of two cities — plus one — to help you make an informed decision about how to make the most of your time. Ships typically dock in Warnemunde, a seaside resort that was famed for its baths and spas in the 20th century. Today, Warnemunde is a bit as if Miami were to meet the Baltic. Beaches are wide and sandy; hotels and bars line the streets across from the beach. Simply strolling the beach, or bicycling, is reason enough to visit Warnemunde. A few summers ago, I visited Rostock and Warnemunde on Holland America Line’s Westerdam. Disembarking for the day, I found help and maps in the cruise terminal. With information in hand, I boarded the train for the short transit to Rostock. Once in Rostock city center, I transferred to a tram to get to the central square, Neuer Markt. From the ship to the central square took only about 30 minutes, including the transfer on the tram. In the tourist information center, situated on the square, I learned that the city features a town wall, gothic churches, charming shops and cafes. I was advised to begin my exploration of Rostock at St. Peters Church, where I took the elevator up nearly 12 stories for a view of the city. Afterward, I walked the city squares and wide pedestrian streets, stopping for bratwurst before heading back to Warnemunde by boat. In Warnemunde, I rented a bike near the train station and rode for a couple of hours along the promenade skirting the beach. Westerdam did not depart until 10 p.m., so after dinner on the ship, I walked back into Warnemunde. When I returned to the ship, the trains were returning with passengers who had opted for Berlin. As I watched them disembark, tired from the long journey but enthused about what they had seen, I was glad I stayed nearby. But as with most things, I had a tinge of “buyer’s regret” that I had not seen Berlin. On another Baltic cruise, I decided to head for Berlin from Warnmunde, nearly a three-hour journey by train each way. Here’s how to make the most of one day in Berlin if you’re not on one of the excursions offered by the cruise lines. Prepare for a long day, which requires a 150-mile journey each way by train or bus to Germany’s capital. 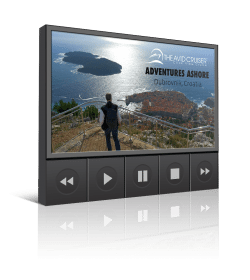 Your goal is to see the major sites, including the remains of the Berlin Wall, historic Brandenburg Gate and the Reichstag building. 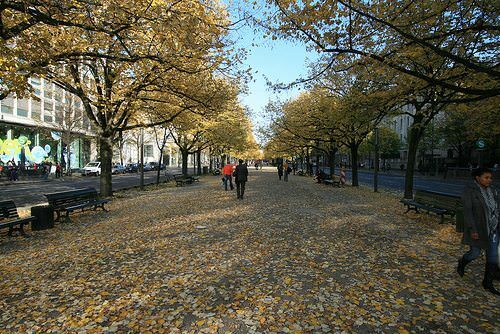 You can do all that, and you’ll also have time to walk Berlin’s most famous boulevards and sample one of the city’s many museums. After arriving at Berlin’s main train station get yourself on the S Bahn to the Zoologischer Garten (it’s only three stops – about 10 minutes). 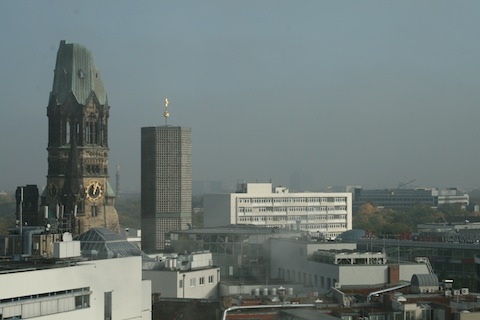 Once there, head outside to admire the Kaiser-Wilhelm-Gedächtniskirche, destroyed in a World War II air-raid. The emotional effect of seeing the stark shell of the church is a powerful reminder of the devastating effect of war. The Kaiser-Wilhelm-Gedächtniskirche, destroyed in a World War II air-raid. Board double-decker Bus 100 in front of the Zoo railway station for city tour using public transportation. Take a seat on top to enjoy the scenic ride that carries you through the Tiergarten (Berlin’s large city park), past the Reichstag, along Unter den Linden, and around Alexanderplatz, the open square and public transport hub. 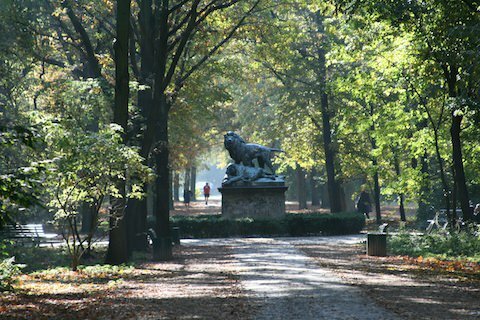 Berlin's largest city park, Tiergarten. Exit the bus at Museum Island, situated on the Spree River and home to four internationally renowned museums. Any one of them is worth your time, but as you are trying to maintain a schedule, limit yourself to the most popular, the Pergamon, home to original-sized, reconstructed monumental buildings such as the Pergamon Altar, the Market Gate of Miletus, and the Ishtar Gate, all consisting of parts transported from the original excavation sites. 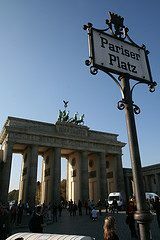 Leaving Museum Island, stroll along Unter den Linden until you reach Pariser Platz, a prestigious address in prewar times that has returned to its former glory. Surrounding the square are the American, French and British embassies, and on one corner is the beautiful Hotel Adlon Kempinski Berlin. Take a seat at an outdoor table at Restaurant Quarré and split a Chocolate milkshake, pricey at 9 euros, but worth the experience and the view — and plentiful enough for two. From your seat outside Hotel Adlon, take time to admire Brandenburg Gate, once the formal entrance to the city and still a grand symbol of Berlin. When you’re done, head through the Gate, across Ebertstrasse, to the Reichstag. The first parliament of the German Empire, the Reichstag was opened in 1894 and housed the German parliament until 1933, when it was severely damaged in a fire supposedly set by a Dutch communist. This fire proved to be a valuable excuse for the Nazis to suspend most civil rights and increase the state security apparatus. Following World War II, the Reichstag building again became the seat of the German parliament, and in October 1990, the official German reunification ceremony was held there. The building was completely reconstructed in a project led by architect Norman Foster and completed in 1999. Check your watch. If time allows, take the free elevator up into the dome, which the locals call “the light bulb,” for stunning city views and to watch the democratic process take place below. Head back to Ebertstrasse to the Memorial to the Murdered Jews of Europe. 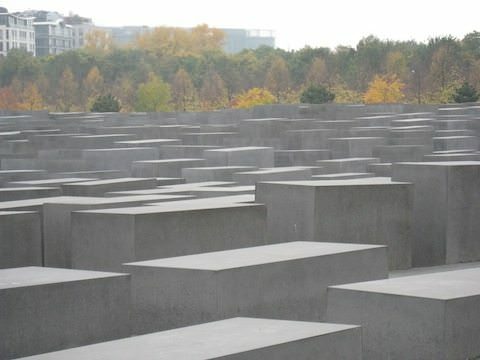 Also known as the Holocaust Memorial, the five-acre site has thousands of irregularly sized concrete slabs arranged in an unpredictable grid. According to the designer’s project text, the slabs are designed to produce an uneasy, confusing atmosphere, and the whole sculpture aims to represent a supposedly ordered system that has lost touch with human reason. About a block away, you’ll find a sign marking the spot of the bunker where Adolf Hitler and his wife Eva Braun committed suicide. Move on to Potsdamer Platz, a study in urban renewal and modern architecture, and continue to the Topography of Terror, a free, open-air exhibit on the organizations of the SS and the Gestapo, their crimes and their victims. 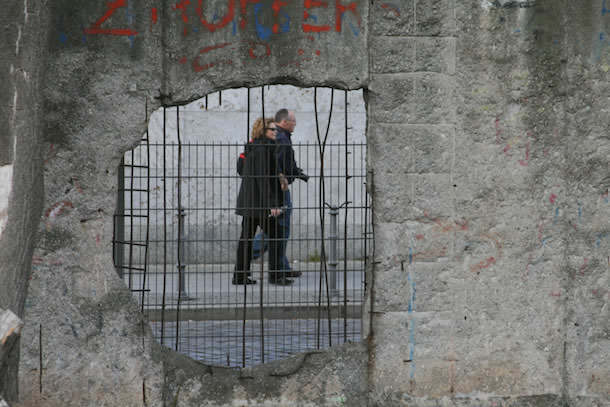 The site is bordered by a remaining stretch of the Berlin Wall. 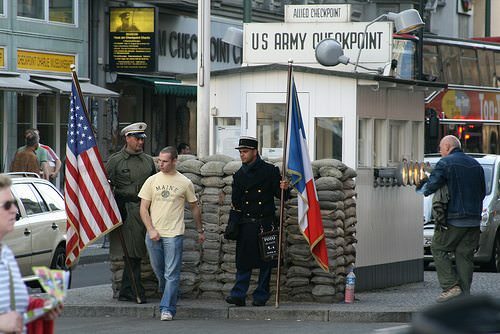 Checkpoint Charlie lies another 250 yards further east. After viewing the Topography of Terror, continue on to the Mauermusuem Haus am Checkpoint Charlie, which is open until 10 p.m.
From Checkpoint Charlie, walk up the other side of Friederichstrasse six blocks to Berlin’s most beautiful plaza, Gendarmenmarkt. Twin cathedrals (French and German) topped by tall domes in the gorgeous Baroque style anchor this square, with the grand Konzerthaus standing between them. Each church has attractions: On the south side, the Deutscher Dom offers a government history museum, while the Franzosischer Dom has a nice restaurant and a tower with wine bar and dizzying spiral staircase leading to a panorama view. Find your way to double-decker Bus 200 to travel the opposite side of the Tiergarten to the Zoo, and make your way back to the main train station and back to Rostock/Warnemunde before your ship departs. That article is so interesting and makes a very nice image in my mind.I visited your blog for the first time and just been your fan. Keep posting as I am gonna come to read it everyday.